After a weekend of mostly work (what else is new) I finally have two days to focus on designing more greeting cards for the Stationery Show in May. There is so much joy and freedom in designing these little letterpress creations— free to create the words and images I like without client intervention! 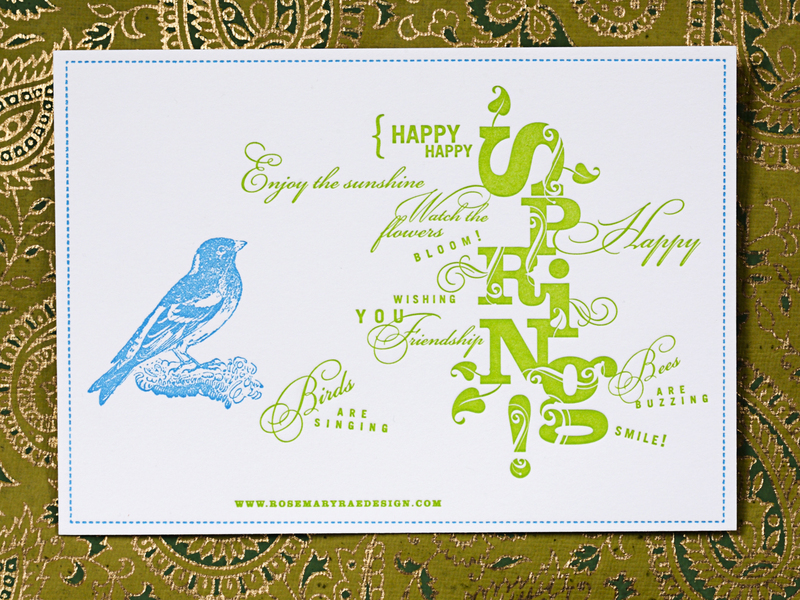 The newest card to be finished is pictured here, my little spring bird paired with playful green text. A lot of cards begin as scribbles and doodles on paper, and then I sit at my computer and begin crafting the words into a typography/collage/visual. Adding in details such as punctuation, dingbats and other little elements make it dance. Spring is a time for reinvention and I am excited about my new business venture ahead. « stationery show prep has begun!